BMI – What Does Body Mass Index Mean? Body mass index (BMI) is a standard measure used to assess the amount of fat in the body in proportion to the height and weight of a person. This is a medically accepted measuring standard to know whether a person is an underweight, normal weight, overweight or obese. BMI is very useful for assessing your weight loss requirements. You can decide upon the amount of weight need to be shed or how much weights to be put on if you are underweight to be healthy. There are some methods and formulas used for manually calculating BMI. Let us have a look at the two most commonly used BMI measurement methods. The calculation of BMI follows a simple metric system. BMI is obtained by arithmetically dividing the total weight of your body with the squared sum of your height in meters. Here is an example that will give you a better understanding of BMI measurement in the metric system. The BMI calculation steps followed in the imperial system is a bit different from the metric system of measurements. STEP 1: The total weight of the body needs to be multiplied with 4.88, a fixed standard number. The multiplied sum of the body weight in Step 1 needs to be divided by the squared value of the height. 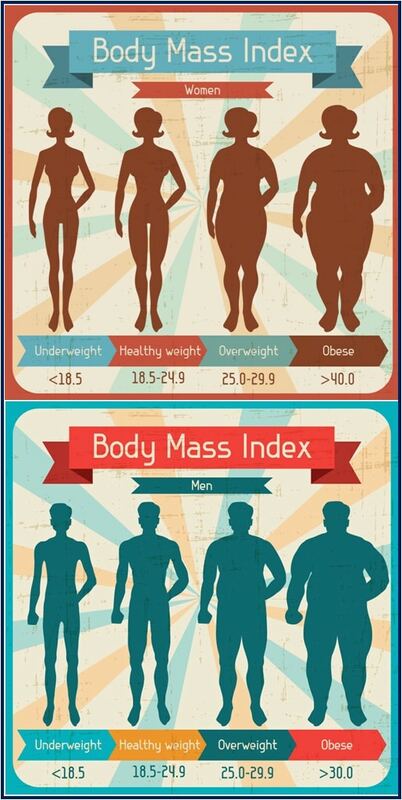 Let us look at a practical example to understand this BMI calculation better. 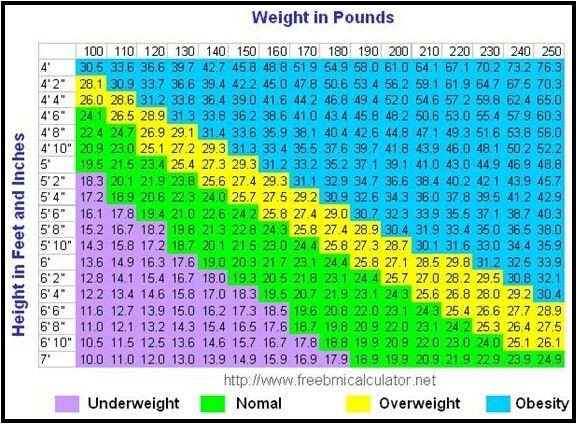 There are also other formulas used for measuring BMI. 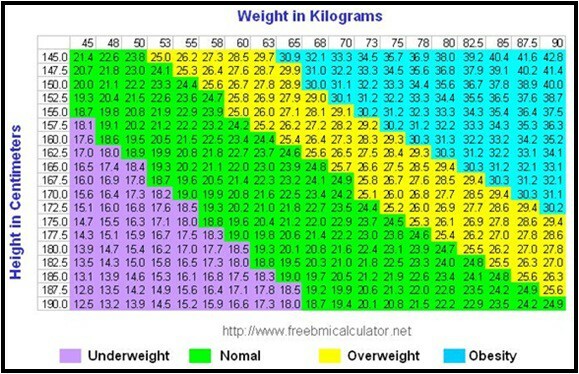 The below-given charts will help you to identify your weight category. If your body weight is falling under Underweight or Obesity level weight category, you need to make changes in your diet and nutritional habits; and if required suitable medical treatment for the same. Overweight category is also bad and needs your special attention to reducing body weight. Your health is in very bad shape if your BMI is above 30; this is in the high-risk category of developing diabetes, cardiovascular diseases, heart attacks, stroke, etc. The very low body mass index is as dangerous as the obesity category. They are highly prone to all common diseases and general weakness. Is BMI A Reliable Health Indicator? There is divided opinion on the reliability of body mass index measurement. Many doctors and health experts say BMI is not a foolproof measurement to be relied upon. There are numerous instances where people appeared to be overweight, but they continued to live a healthy life with no health hazards. There are also numerous cases where people with ideal BMI measurement suffering diseases associated with overweight and obese people. Another valuable argument against BMI is its generalized result. The body weight is closely related to bones, muscle mass, fat and water content in the body. There are so many who weigh higher because of the large bone structure and heavy macular build up. Just, for example, a well built and muscular athlete cannot be negatively categorized as overweight or obese because of the higher body weight. However, BMI could be a good indicator of the health conditions of most adults who follow a common generic lifestyle. BMI is not able to exactly pinpoint the amount of fat in the body and location of the fat. Mass, fat storage in different parts of the body does not have an equal amount of health hazards associated with it. The belly fat is more dangerous than the fat on the hips. Some argue that it is better to assess the fat in the body by measuring the waist circumferences in proportion to the height of the person. Lastly, if you are not an athlete, or an older adult or a teenager, then BMI could certainly give you some basic understanding of the healthiness of your body and about body weight. BMI is only an indicator and not a reliable predictor of your health conditions. BMI index is not a precise indicator tell of you health. Some obese people do stay healthy; there are people with right BMI score still face cardiac problems that obese should be the victims of. Amazing! I just checked my BMI at your scale. It is accurate. This blog looks just like my old one! I am slightly overweight. But I will bring it down, as I am embarking on intense weight loss regimen from next month. This website truly has all the info I wanted concerning this subject and didn’t know who to ask. Great Blog. Kristina ..nice info on BMI. Thank you. BMI (body mass index) is a screening tool used to measure weight relative to height. However, it does not say whether a person is healthy or unhealthy. The excess weight always does not mean excess fat in the body. A person can be well built with muscular body whose BMI may be comparatively higher, yet the person is healthy without any excess fat in the body. BMI is only a rough indicator…but need not be taken for 100% reliable. In fact most of the physician have scant regard for BMI measures. I like the point you motioned that ‘BMI is not a 100% reliable health indicator’. It only gives a rough idea about health status. Thanks for the detailed explanations on Body Mass Index and the Calculator engine added here.